Two months ago when suddenly one speaker of my Skullcandy JIB earphones stopped working, I decided to buy new earphones so that I can continue enjoying music on my iPhone 4S. At the store I saw these Skullcandy Ink'd 2 earbuds and bought it without much thinking. I was never a Skullcandy fanboy and not knew much about the skullcandy products, My JIB earbuds were good and I had already heard a lot about the Ink'd earbuds. The sales man at store recommended me Ink'd 2 and said that It's a new product and better than the older version of Ink'd. I liked the appearance of Ink'd 2 and without wasting time I bought it. Unlike my old skullcandy JIB, The Ink'd 2 also came with an inbuilt microphone and music control button. I love listening music while traveling in a bus, train, taxi etc. and I hate taking out my iPhone everytime I want to Skip / Play / Pause a song. With music control button, Now I can freely control music without taking out my phone. Now Its been 2 months since I'm using these earbuds and today in this post I'm going to talk about these earbuds and will go through my experience with them. During these 2 months listening was done using these earbuds on iPhone 4, iPhone 4S and Samsung Galaxy S3. Cable type: Flat Cable, Anti-Tangle, Durable. Cable length: 1.3m TPE Cord. My Skullcandy Ink'd 2 earbuds were Black in color and came with an inbuilt-microphone. The earbuds were built with plastic and rubber on some places, The cable was Flattened and rubber coated and because of this it was Tangle free. The speakers were made of matte plastic with a glossy plastic ring. The microphone was of glossy plastic and had a button for receiving calls and controlling music. The headphone jack was gold plated and above part of the jack was made of rubber. There were more than six Skullcandy logos on the earbuds: One behind each speaker, One on the microphone button, One on the divider, two above the headphone jack. The Rubber gels or eartips also had two logo's each. The overall quality was very good, at least for me and seemed pretty nice on touch. I really loved the Flat cable, It was stylish, durable and was rubberized to prevent tangling. The Skullcandy Ink'd 2 were pretty comfortable for me when using the stock ear tips. I was provided with 2 sets of eartips of different size. One was already on and the other was too small for me. But fortunately the one on the earbuds was able to seal my ears completely. The Earbuds has L/R indicators on each speaker which indicates the side you should put that speaker to (Left/Right). The earbuds were comfortable for me during listening, However if you listen music for hours then you might find them a little un-comfortable but for me listening music for 1-2 hours was just fine. The earbuds are light weighted which makes it comfortable wearing and prevents falling off your ears. 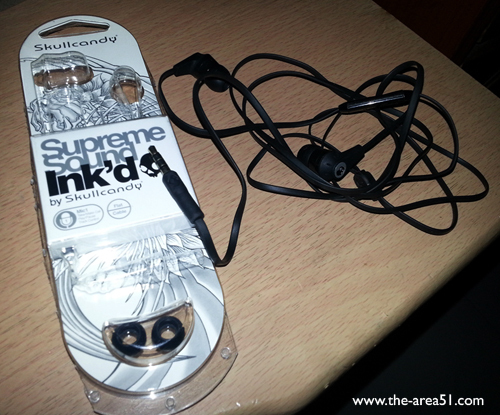 The Supreme Sound, Ink'd 2 Sound quality was pretty good and I believe much better than the Ink'd. The Bass was just great, according to my needs. When sealed in ear the Ink'd 2's Bass will blast your ears with its thumps... Overall Bass quality was very good and had much more bass as compared to other earbuds of same price range. The mids and highs on Ink'd 2 sounded great, There is a little harshness but overall they're just good. The clarity of sound and vocals is great and very natural as said by the company. I really enjoyed listening music with these buds on and I'm very much satisfied with them, Of course for the price you pay the quality is awesome. The earbuds work better with Rap / hip-hop, Pop, Rock, Electronica, Soft Rock and metal. The Supreme Sound as said by the company, The Ink'd 2 are much better than Ink'd and my older JIB's. 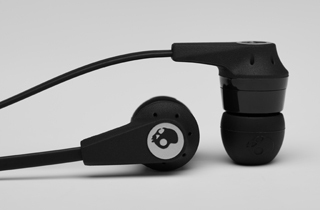 Skullcandy Ink'd 2 come with an inbuilt microphone with a button for Answering / Ending Calls with one click. The button also works as a music controller. With One click you can Play/Pause Music, Two clicks for skipping song and Three clicks to go to previous song. Works with most devices including iPods, iPhones, Blackberry, Samsung, HTC etc. Pros: Stylish Looks, Tangle Free Cable, Great Build Quality, Amazing Sound and Bass, microphone, music can be controlled with mic button. Cons: No volume up/down Button, No cable slider, Only 2 pairs of eartips, No Carrying Case. 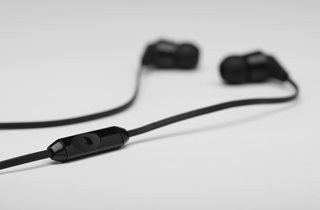 If you can only spend around $30 for earbuds then Skullcandy Ink'd 2 is a very good option. Overall the Skullcandy Ink'd 2 are worth the price you pay. The Sound quality is just awesome and the build quality is also up to the mark. Ink'd 2 also satisfies in terms of brand value. I would recommend these earbuds to everyone who is looking to buy a new buds for less price and with amazing sound and bass. It would have been awesome if these buds came with a carrying pouch just like the 50/50 skullcandies, but still great.